Hello everyone! 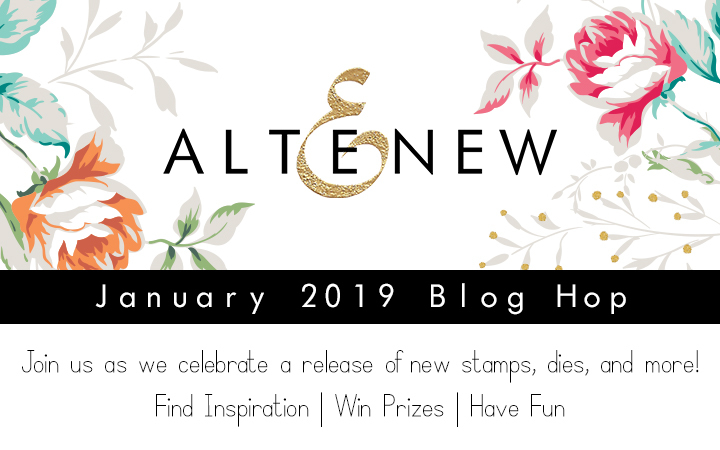 I am so excited to be a part of Altenew January 2019 Stamp/Die/Stencil Release Blog Hop today! You should have come from Reiko Tsuchida, but if not please start at the Altenew blog. I made a several cards to celebrate Altenew January release! 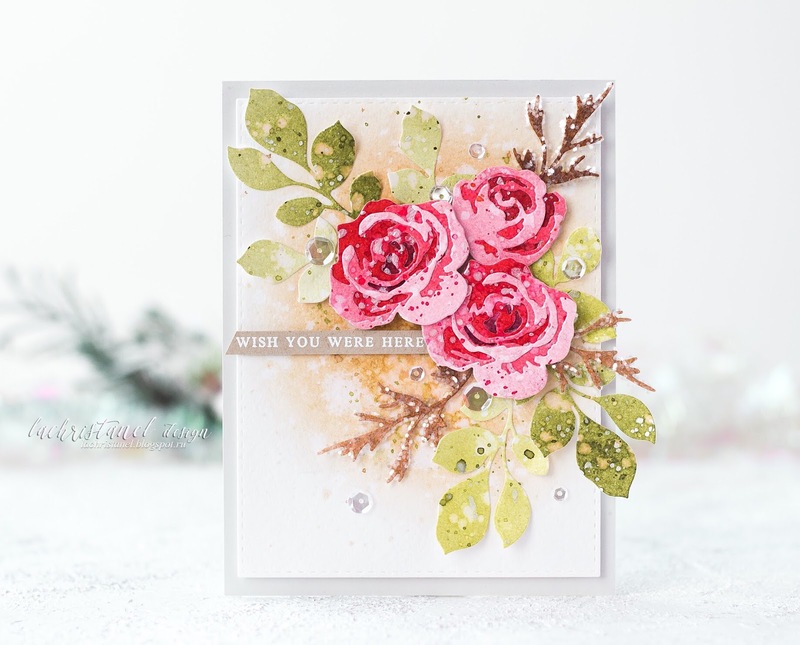 My first card featuring gorgeous Garden Picks 3D Die Set. I absolutely love that Altenew's 3D roses. I've started by blending some reds and pinks ink onto pieces of watercolor paper and splattered them with water and silver paint. Once it was dry, I die cut the roses and glued them together using liquid glue. I repeated the process with green inks for the leaves. For the background, I blended some beige inks onto piece of watercolor paper and splattered it with water and gold shimmer spray. Then, I adhered the flowers and the leaves on top of my panel. At last, I decided to add glittery branches for more interested look. I know, that die is a part of the leaves, but I think it's looks perfect as a branch, too. To finished my card I added a few sparkling sequins. My second card with beautiful Wonderland stamp set. I stamped the images from the set onto kraft cardstock with clear embossing inks and white heat embossed. Then I colored the flowers using Altenew watercolors. 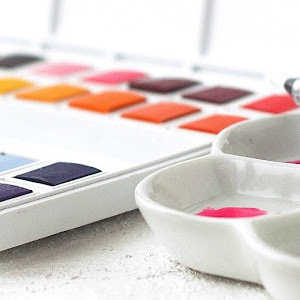 Altenew watercolors are opaque and perfect for coloring onto kraft paper. Then, I splattered my panel with leftover paints and also silver paint. 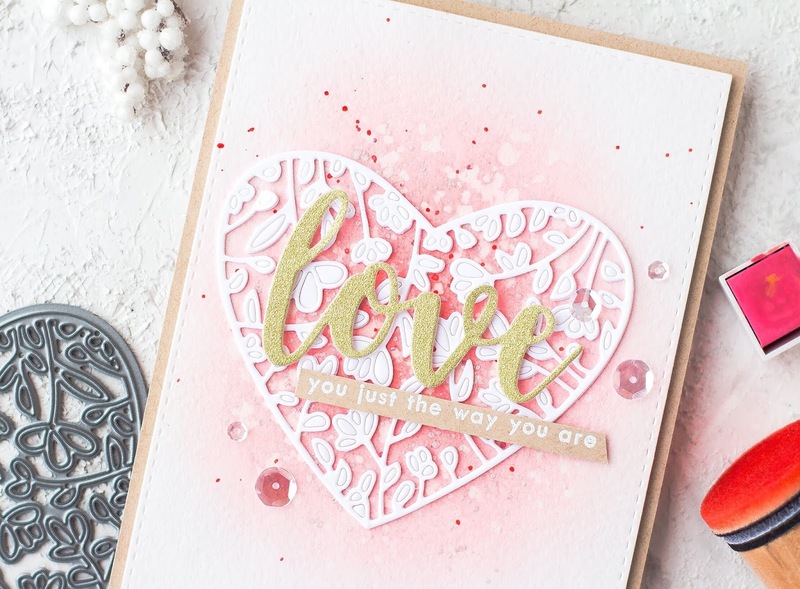 Next card featuring beautiful Floral Heart Frame Die. That die is perfect for quick Valentine's Day cards. I blended some coral inks onto watercolor panel and splattered it with water and silver paint. Next, I die cutting heart out of white cardstock two times and glued them all together with liquid glue before adhered on top of my panel. Next, I die cut the word Love out of gold glitter cardstock and mounted it onto my card with foam tape. 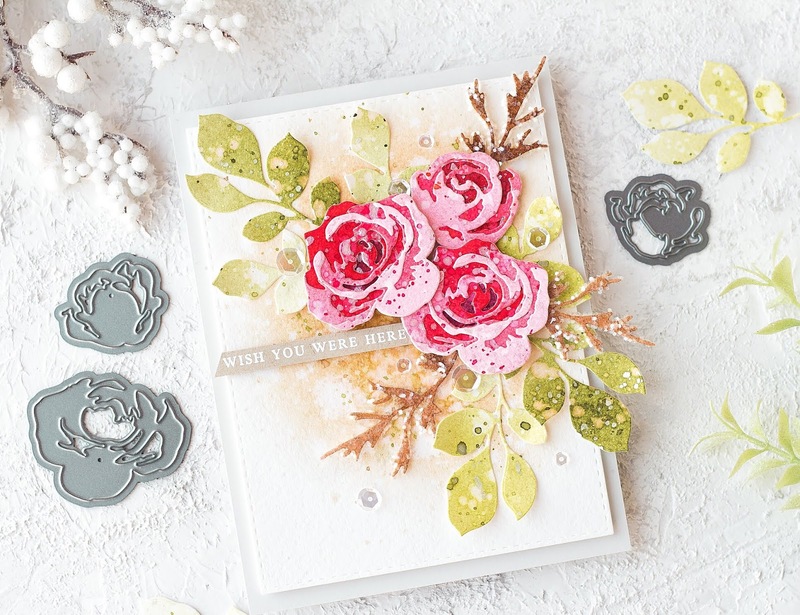 Next card featuring gorgeous Dainty Bouquet stamp set. 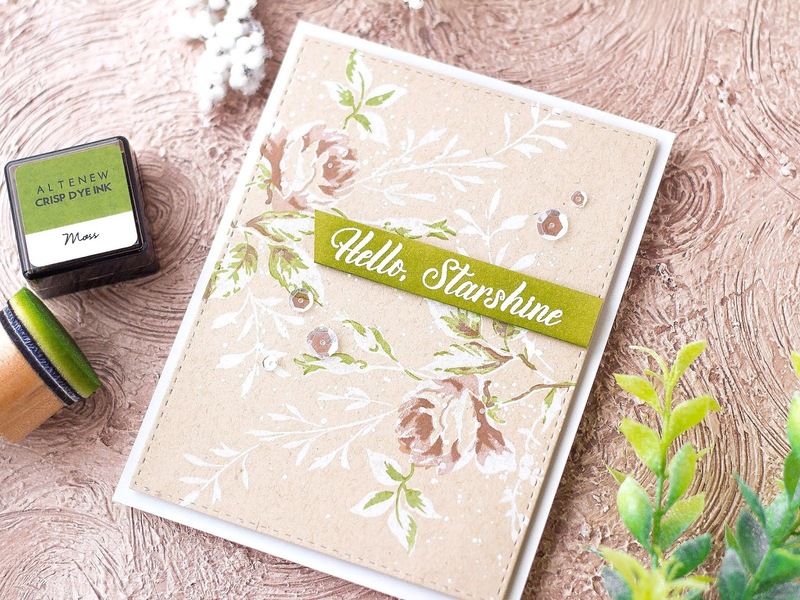 I decided to make soft muted vintage card with this beautiful layering stamp set. I stamped first layer onto kraft cardstock with white pigment inks and heated with a heat gun. Next, I stamped the other layers using brown and green Altenew inks. Then I splattered my panel with white paint. I white heat embossed a sentiment onto stripe of kraft cardstock and blended some green inks on top of this and foam mounted onto my panel. My last card with absolutely amazing Radial Hearts Cover Die. I blended some coral inks onto watercolor paper and splattered it with water and silver paint. Next, I die cut the heart panel out of white cardstock and adhered on top of my blended panel. 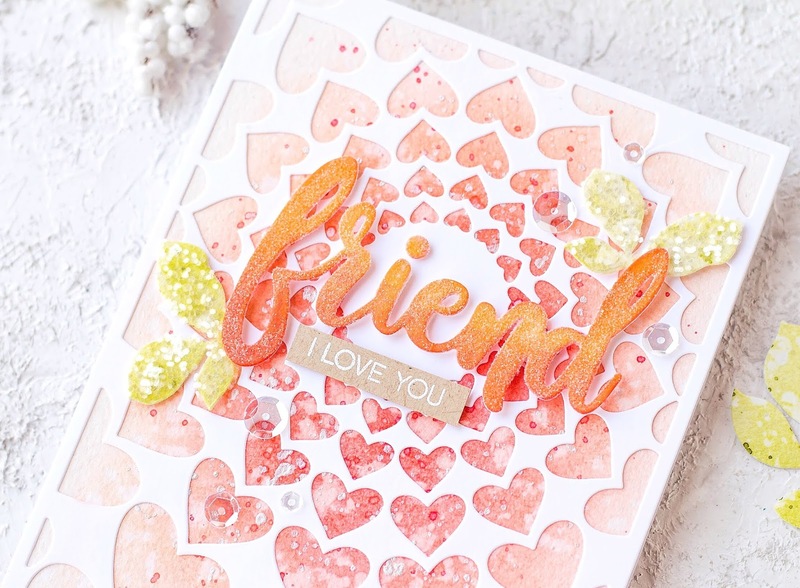 For the sentiment I die cut Friend using Simply Friend Die out of white cardstock and blended orange inks on top of it. Next, I coated it with Ranger Multi Medium Matt and sprinkled with clear glitter. I used two leftover leaves from my previous card, and also sprinkled it with chunky glitter. Hope you liked my cards! Don't forget to leave a comment for a prizes and a giveaway. Thank you so much for stopping by! 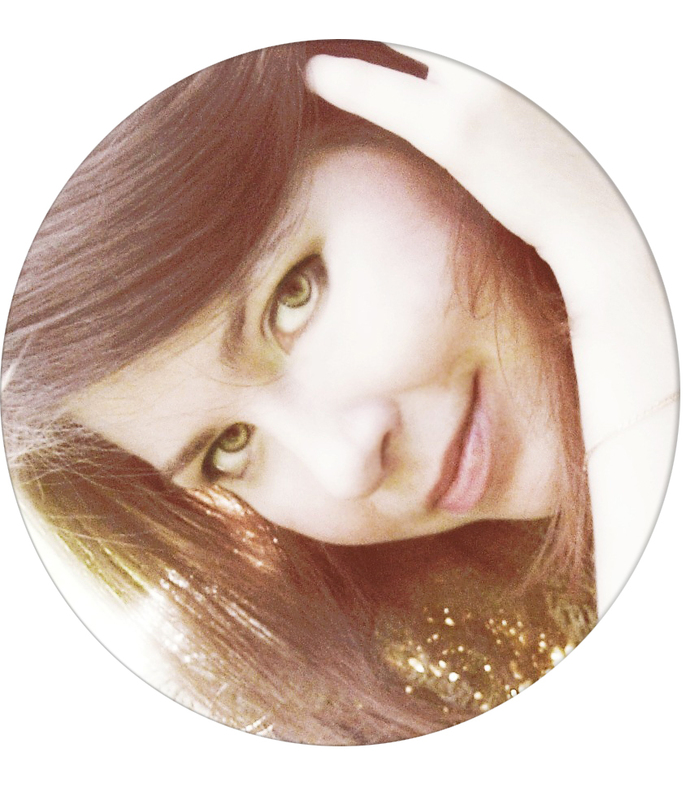 Your next stop is Vicky Papaioannou! To celebrate this release, Altenew is giving away a $50 gift certificate to SIX lucky winners! 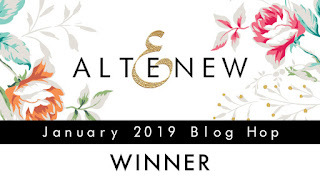 Please leave a comment on the Altenew Card Blog and Altenew Scrapbook Blog by 1/31/2019 for a chance to win. 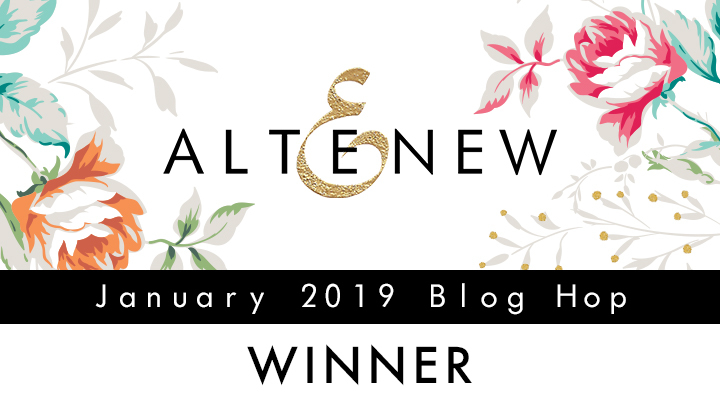 Six winners will be announced on the Altenew blogs on 2/3/2019. I will also randomly choose a winner from the comments left on this post and the prize will be $30 gift certificate to Altenew online store. One lucky winner will be announced on 1/30/2019 on this post. The winner of $30 Gift Certificate is Linda R.
Congratulations! 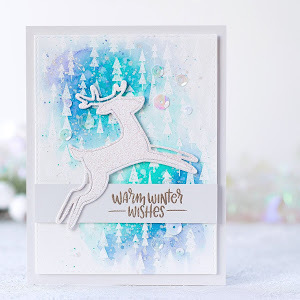 Please write at winner@altenew.com by 2/15/2019 with the subject line Altenew January 2019 Stamp/Die/Stencil Release Blog Hop Winner from Kristina's blog. Your cards are so beautiful. I love the subtle palette that you have used. Thank you for sharing your designs with us. Wow! Your cards are stunning!! Stunning cards! 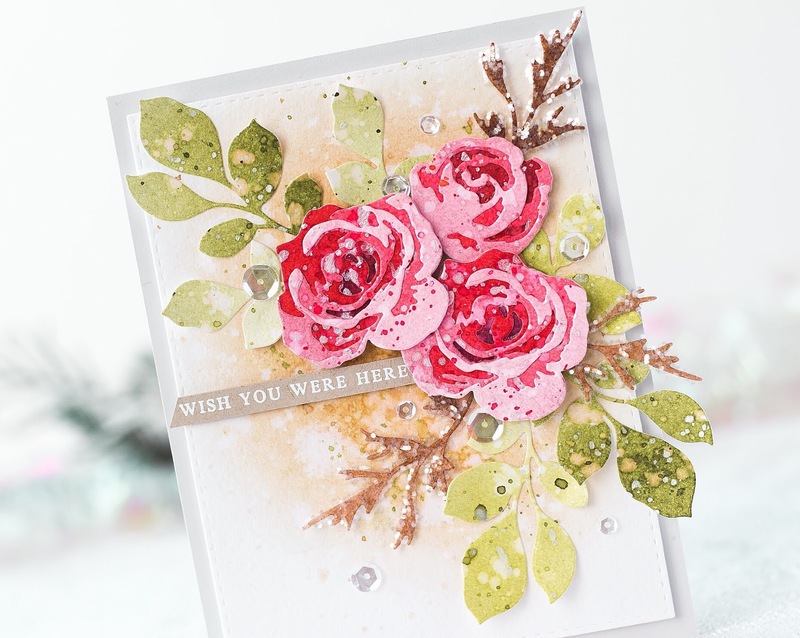 I love your Dainty Gardens soft tones, your fabulous backgrounds and your Garden Picks card. So many gorgeous details! Your Floral Heart frame is lovely! Your cards are always so stunning! Makes me want to buy everything!! You are an inspiration!! 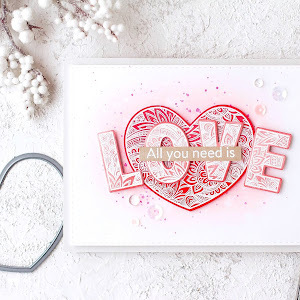 I love the radial hearts cover die and you've made such a beautiful card with it. So pretty. All of your cards are beautiful. Watercolor is my favorite medium, all of your creations are lovely. Thanks for sharing these fabulous cards. 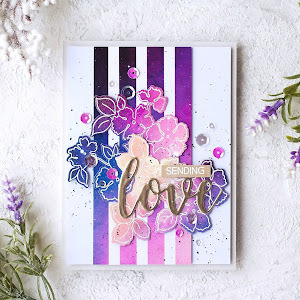 So many beautiful cards Kristina - I especially love the one using the Floral Heart Frame die! I drool each time I visit your blog! Love your style! 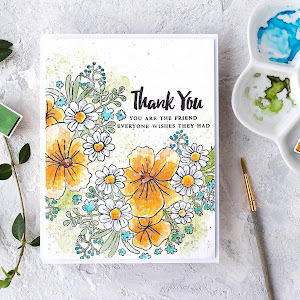 Every time I think I have enough flower stamp sets, along comes a release like this one! Thanks for your wonderful cards, they are truly beautiful. I think the Garden Picks die set is my favorite. Wow, your cards are stunning. I really can't decide which is my favorite from this release. 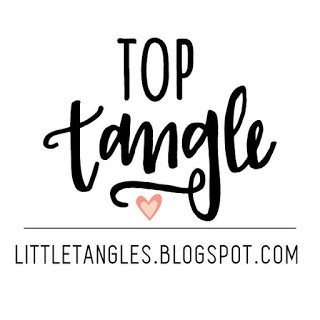 I love this blog hop too, getting so much inspiration from so many talented people is great. Thank you for sharing and inspiring!! Garden Picks 3D is gorgeous! Every single card is just Stunning!!! You inspire me so much!!! Gooooooooooorgeous!!!! I love all your cards - the gorgeous colour, and the beautiful variations in the colours. 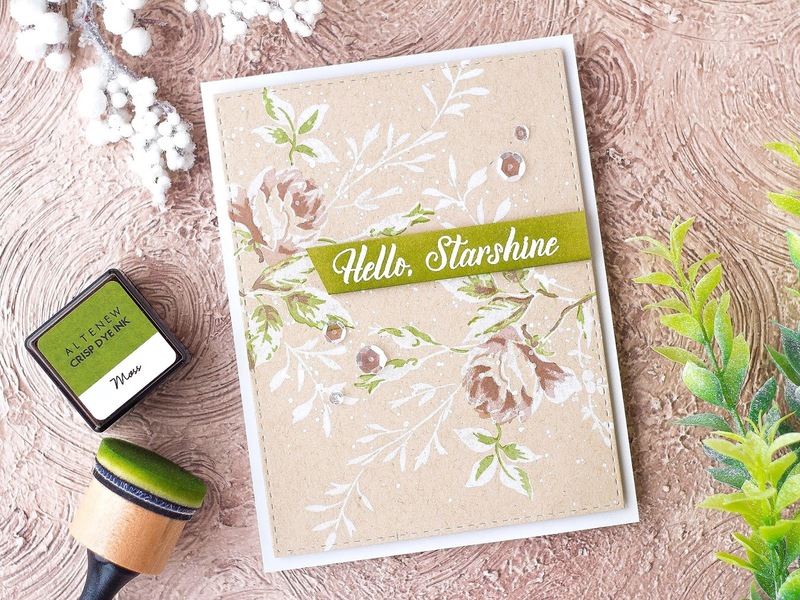 I especially love the Hello Starshine card - simply elegant and stunning in it's simplicity! Great job! Wow, gorgeous cards! I just love your style. So many fabulous cards!! 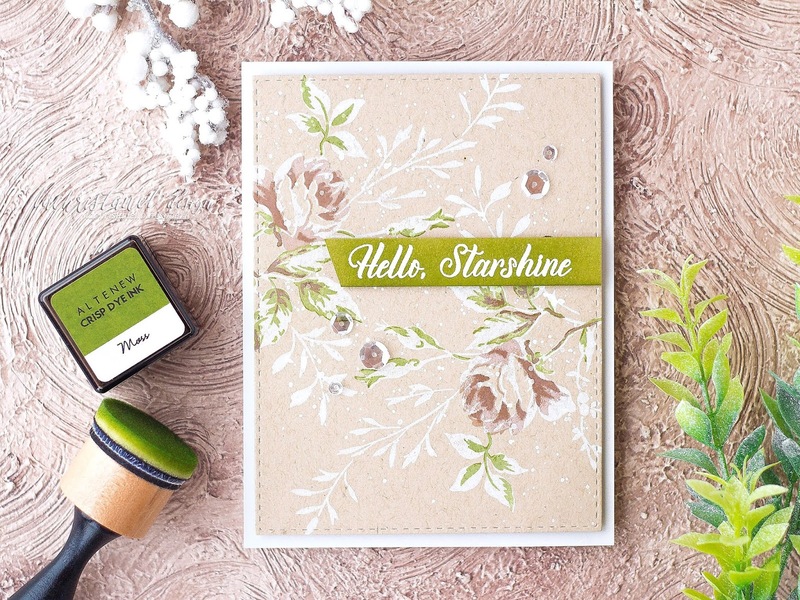 I love the card featuring the Dainty Bouquet stamp set. The soft muted look of this card is just beautiful! 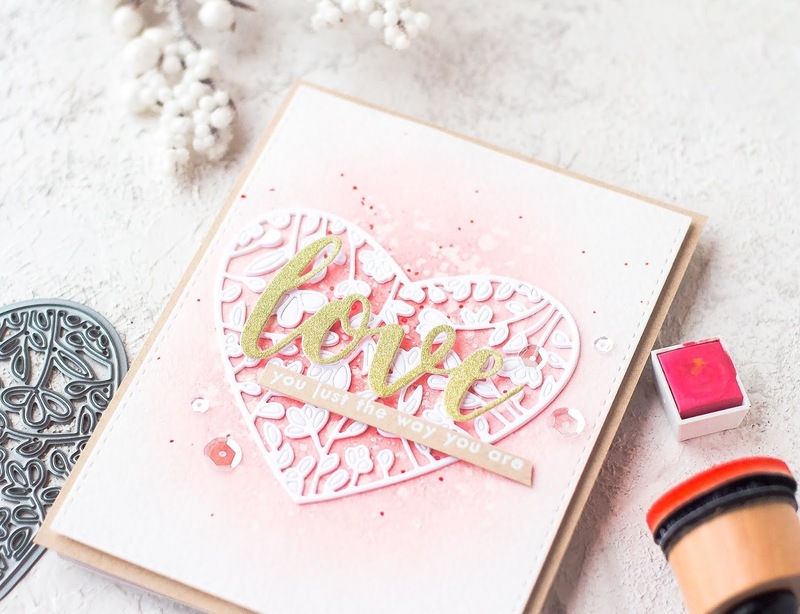 Wow you got such an intense white stamping on that kraft cardstock! What a beautiful result. Thanks for the inspiration! Love your cards! The first one with the Garden Picks 3D dies is my favorite. 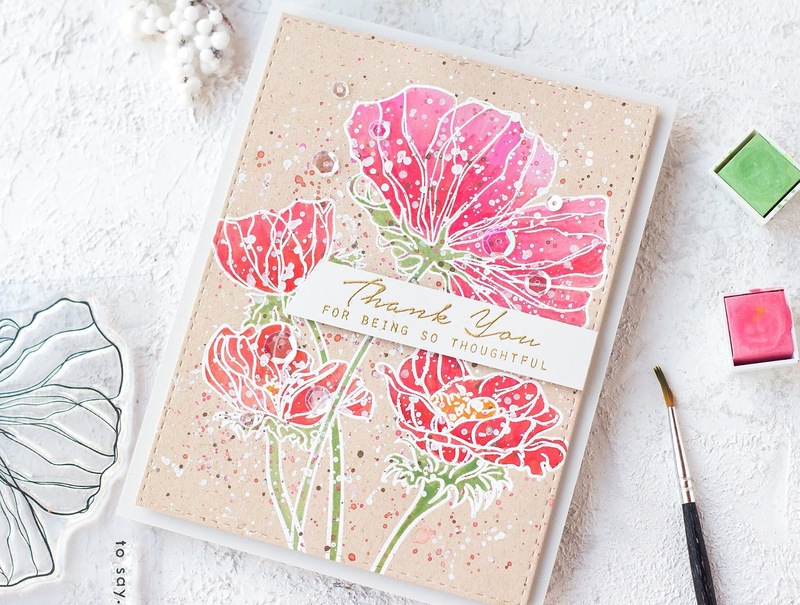 The layered floral dies can look so flat (despite their 3D name) but the way you created texture just brings them to life. Gorgeous! I really love your cards and this release! OMG Kristina! Your designs are stunning! Your talent never ceases to amaze me! 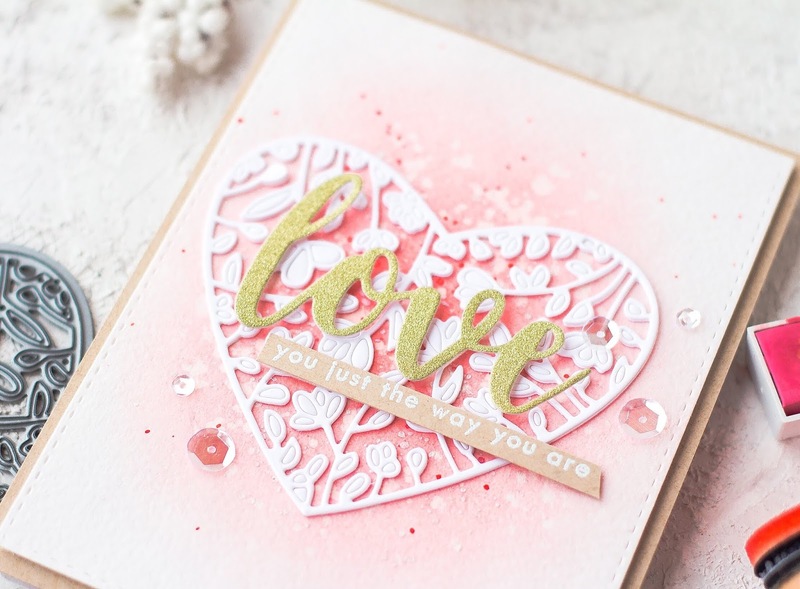 There are so many wonderful products in these release is hard to pick favorites, the new radiating heart cover die is gorgeous! Thanks for the inspiration! Wow....such a pretty line up of card samples....thank you so much....I have a long list of items already on my list...great new release!!! I am so jealous of your splattering skills!!! I love the radiating heart die! 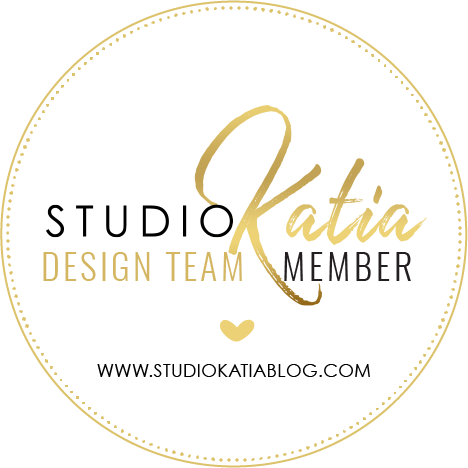 Kristina, your cards are stunning! What an awesome release. I have so many favourites. Thanks for the inspiration! Oh my! Your cards are fabulous! 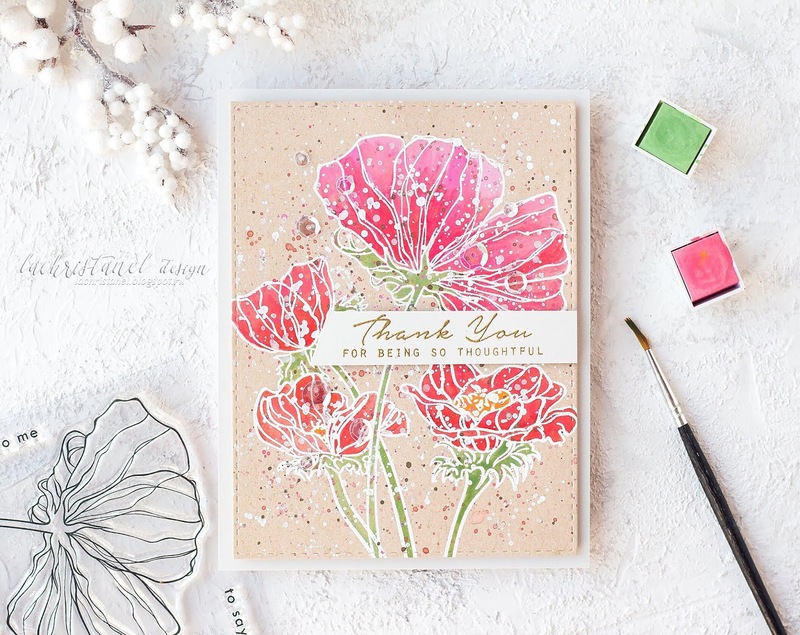 Love your spatter technique on some of your cards--that is inspirational. I just think your cards are gorgeous. I will be back to check out your blog. I think that gorgeous, awesome, amazing are not enough to describe these beautiful cards! Wow! OHH whoa. Love the hello starshine one. I love your cards - especially the Garden Picks 3D love how you colored them! Each project is beautiful. Love the texture you created with your splatters. Your cards are lovely. You seem to have had so much inspiration from this release. Each of these is just a little work of art! I am in love with this release and your showed it up so beautifully! Fabulous designs! Love this release! Each card is beautiful! I already have the Wonderland and Garden Picks 3D on my wishlist, but thanks to you, I've added the Dainty Bouquet. Lovely! Fantastic creations! Always an inspiration! And such a great product line this time! Wow Kristina! You've outdone yourself this time. These are truly beautiful :) Thank You for sharing! 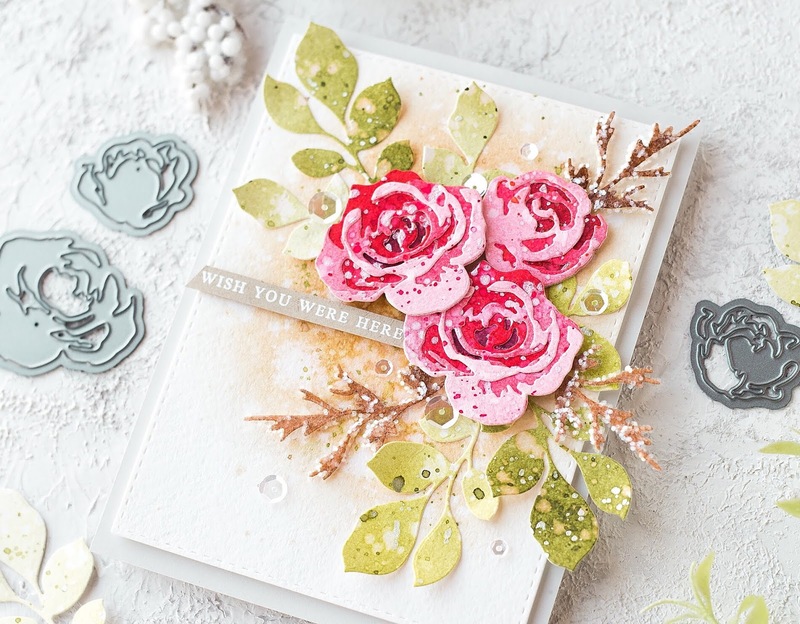 Such gorgeous cards in beautiful tones, Kristina! I particularly love the first and 4th cards and am hoping I can find the dies and stamps here in Australia. Wow, each and every card is a masterpiece. Absolutely stunning work! I love them all! This release is so gorgeous, I want all of it! Your cards are just breathtaking! The addition of the chunky glitter, the little splatters... it all makes such an impact. Love them all! master at the florals. Stunning! Wow!!!! Your cards are all just gorgeous! So difficult to chose a favourite but I do love the first with all the colours working together so beautifully! Thanks so much for sharing and inspiring us! I love the 3D flowers. Your choice of colors are so pleasing. Gorgeous cards!!! I think I need the new 3D floral die bundle! 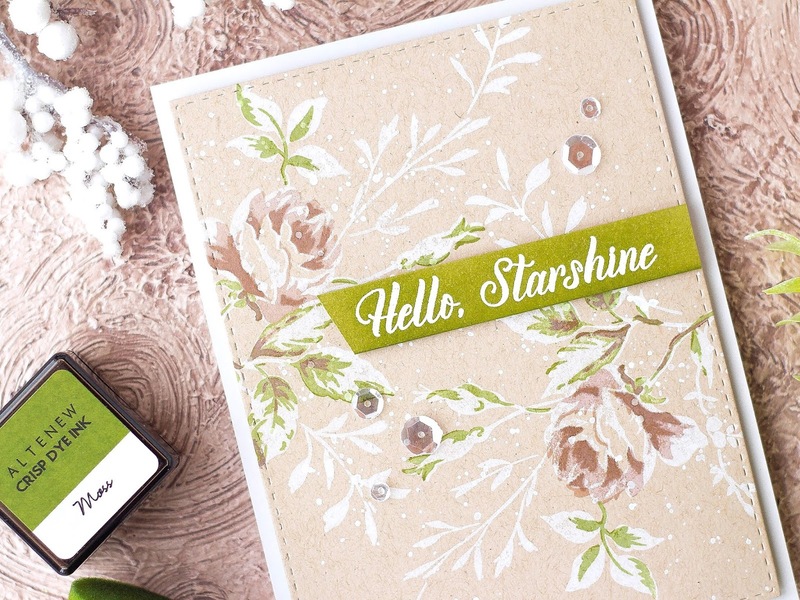 All of these cards are gorgeous and very inspiring! Gorgeous, gorgeous cards! Especially adore the first one, all the special techniques you used! Stunning! Such beautiful cards! Altenew has really upped the game with this release. Awesome Release! Great projects, I especially love the Garden Picks card with all the gold spatters! I must say, your cards must be some of the best and prettiest ones of this hop! I love each and every single one of them - fabulous! I must try the white embossing on the vintage card. Doing in on kraft cardstock really gave it the vintage look you went for. Such lovely cards! You are an inspiration! Your work is so beautiful, so detailled. You showcase Altenew products wonderfully. I absolutely love Dainty Bouquet and your kraft creation is exquisite. every one of your cards is a work of art - all so beautiful!! Super gorgeous Dainty Bouquet card. Love the dainty look of it. Each and every one of your cards is gorgeous! I couldn't choose a favorite. Your cards are gorgeous. I like the splatters. Your cards are so lovely!! I think my favorite is the first one, but it was hard to decide. They're just all so yummy! Wonderful cards Kristina, very elegant. 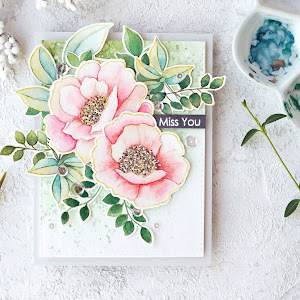 I am loving the Dainty Bouquet set and your card is perfectly done, it looks like pre-printed paper. So beautiful. Your cards are all so beautiful! Love the Garden Picks 3D Die Set. Your cards are stunning! I'm in love with your vintage card. I'm going to try that with kraft paper. I love the look! Thank you so much for sharing your extreme talent!! 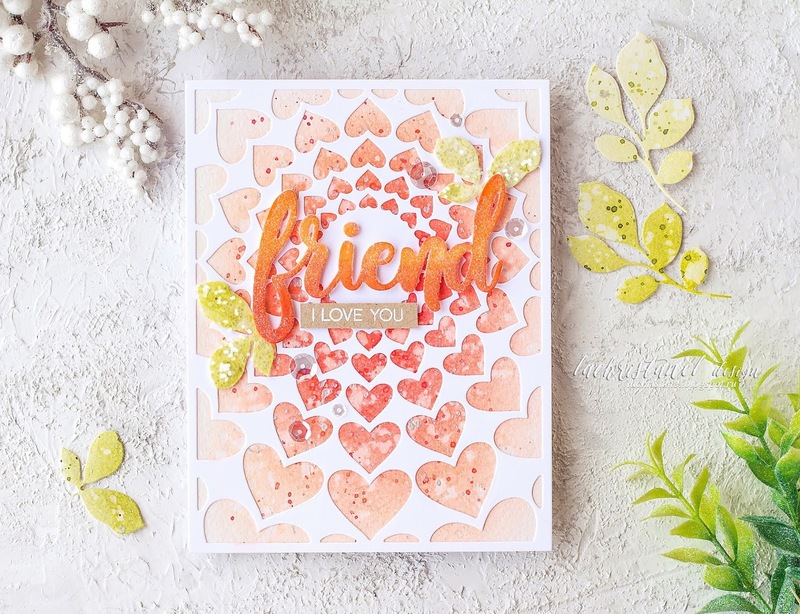 Everything you created is gorgeous, but I especially like the way you colored the paper for the Garden Picks set, and the Radial heart Cover Die card. 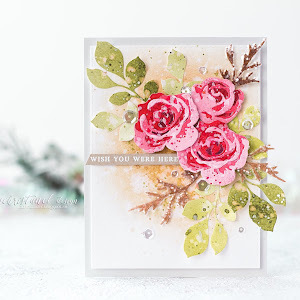 I love the roses in the Garden Picks 3D Die Set. Stunningly beautiful cards! That 3D rose card is so amazing! Thanks for the inspiration! Such beautiful cards! I really love the first card! Beautiful Cards! I love the techniques you used, they really make the cards. So many gorgeous cards. Love the wonderland stamp set and the 3D flower dies. The flowers on your cards are all kinds of lovely. Simply beautiful! Thanks for sharing! 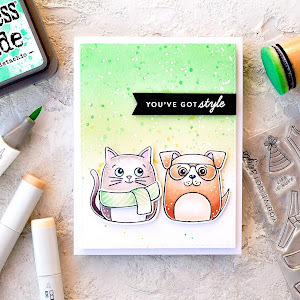 Gorgeous cards and your coloring is so amazing. My favorite is the one with the Wonderland flowers, my favorite set from this release as well. 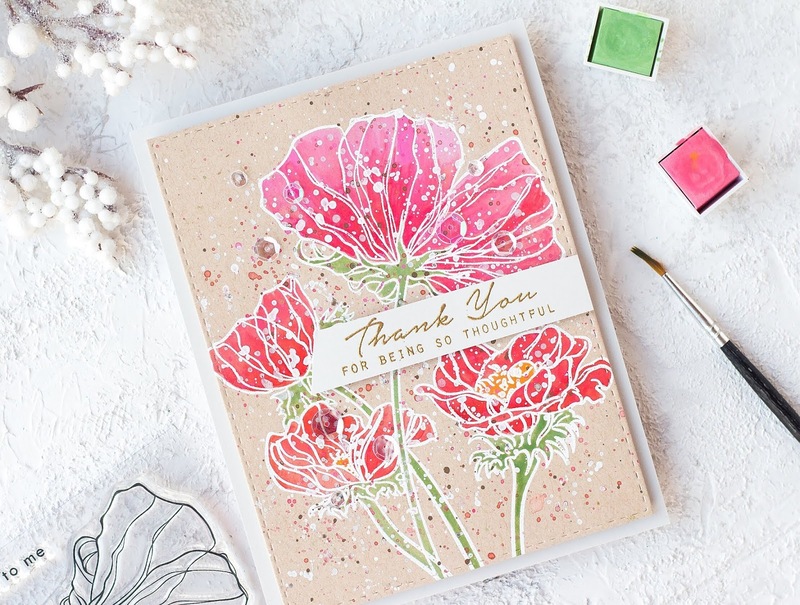 You are so talented and love the watercoloring with Altenew's gorgeous inks. Really makes for these beautiful cards! You always make gorgeous cards. These cards are simply stunning. Each one has it's own radiance. I always look forward to what you will make for us next. Thank you for being there for us to bring us such wonderful inspiration. Love all your cards. They're beautiful! Totally love all your splatters! The first card is drop dead gorgeous... my fav. Your cards are amazing. The white specks and sequins are so pretty. I love your Friend I love you card. The peach is beautiful. Beautiful cards! Really love the splattering you have done. I especially love the Dainty Bouquet card. It is so sweet and delicate! Oh my goodness, I really love your cards! I love soft and sweet cards, with muted colors. There are so many of these stamps and dies calling to me, especially the Garden picks 3D dies! Beautiful cards. I love the soft colors and unique designs. Your cards are all lovely. Beautiful cards!! I especially love the brown & green card! Seriously pretty - lots of inspiration here! Your roses are gorgeous!!! I really like the dainty bouquet set too! WOW! Gorgeous watercoloring on the roses! Your cards are so amazing! All of your cards are stunning! The roses card is exquisite! You're cards are all beautiful! Where did you get the "Hello, Starshine" sentiment? I love your background on the radial hearts. I really love the card using the Wonderland stamp, though, that's my personal favorite. TFS! I luv the extra interest that your splatters give to each design! Your first card is my favorite--utterly gorgeous! The Floral Heart Frame card is my favorite but all your cards are beautiful Kristina! All of your cards are gorgeous! I love the addition of the glittered branches to the first card and I absolutely love the Wonderland stamp card! There is no way I could choose between either of them! They both took my breath away! Thanks for the wonderful inspiration! Wow!!! Your talent is simply amazing. Gorgeous cards! Your cards are so awesome, every one of them! 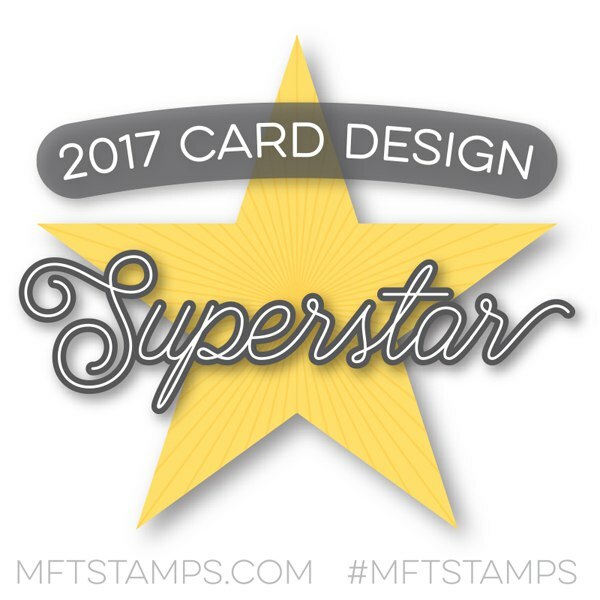 I will be returning to thie post often for inspiration as I play with my own stamps from this release. I do love those Garden Picks! Great watercoloring! What can I say, but that everyone one of your cards is just beautiful.....I have some favorites in this new release...and hope to get them soon. Such a great job....thank you so much for sharing your work. Wow, all of your cards are gorgeous! 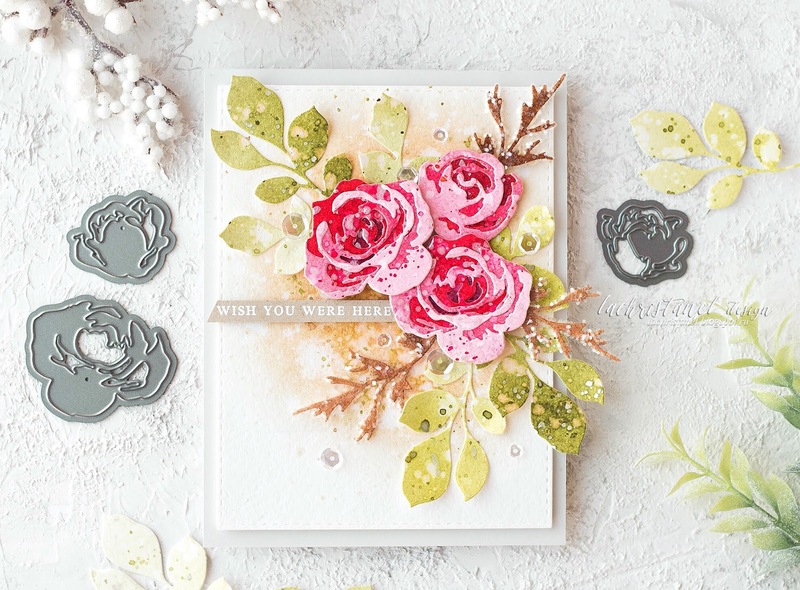 That first card with the 3D roses is stunning! I love how you inked the different layers and added glitter to the branches. Thanks for the tutorial showing how you created this card. Everyone of your cards are stunning!! I love the colors and textures you've added to each of them! Just beautiful! I will definitely use these as inspiration for my future cards! Thank you so much for the videos as well! The Radial Heart Cover Die and Wonderland set have been among my all time favorites! Every single project is jaw-dropping gorgeous! Love the colors you used for each one! My fav is the 3d floral!! Awesome cards! Gorgeous colors and details on each one! 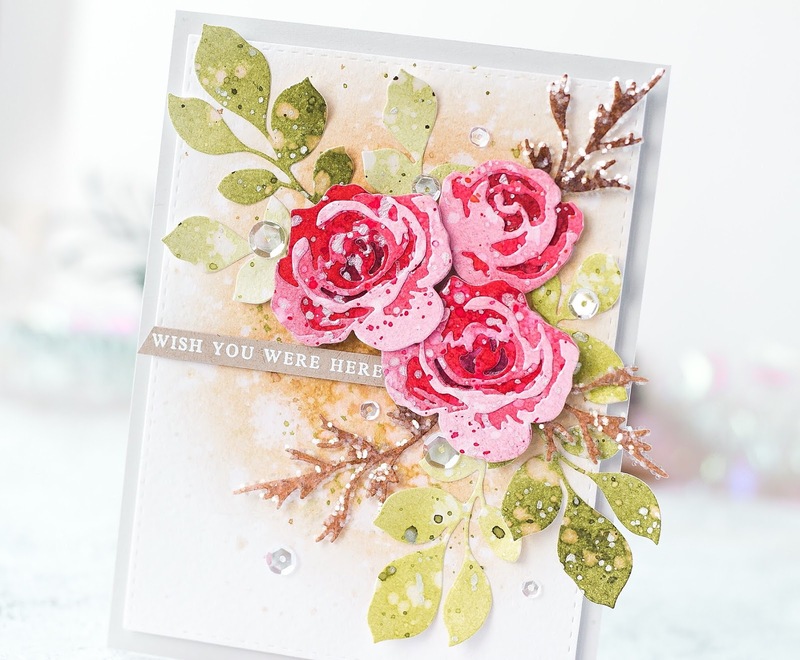 I love your beautiful card with the Garden Picks 3D Die set.... fabulous! 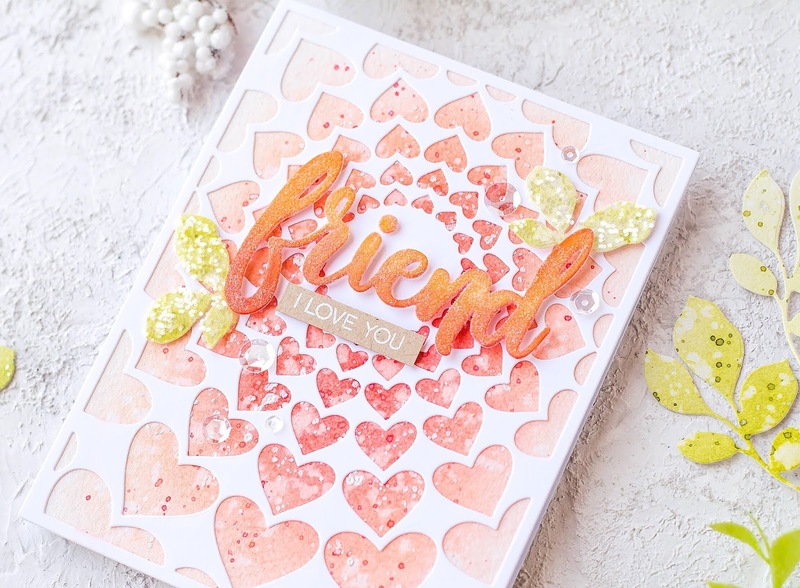 My other fave from this release is the Floral Heart Frame Die! These are all soooo beautiful!! Way too hard to pick just one as a favorite. I just kept changing my mind as I looked at them all! What a great bunch of cards! I love your designs. The colors are very beautiful and your use of spattering adds so much to their beauty. Thanks for sharing all this beautiful work. The first card is especially beautiful and I loved watching your video. Awesome cards...they are ALL my favourite. Beautiful cards! 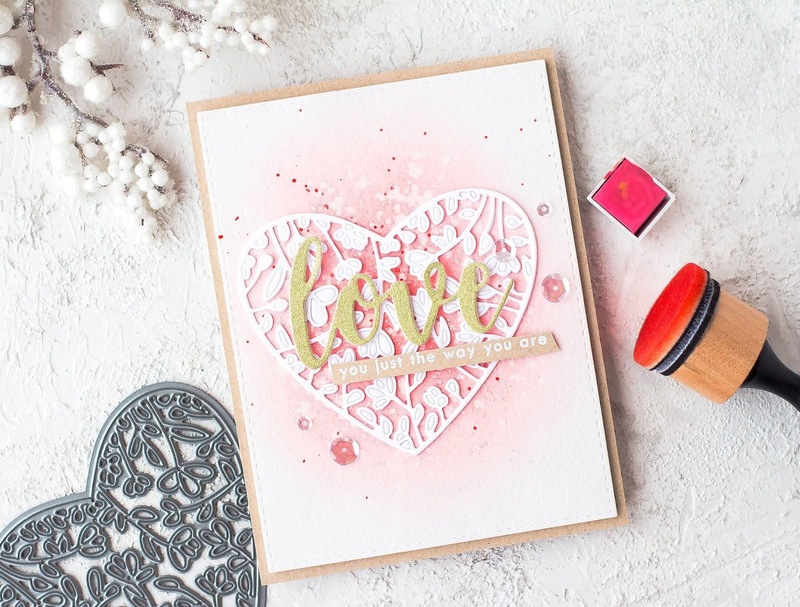 I love the dreamy look you are able to achieve with blending and splatters. I love that style. Thanks for the inspiration! Thank you for sharing these gorgeous cards! What a beautiful new release from Altenew. I love all that you made using Altenew's January 2019 releases BUT MY Favorite is what you made using the Wonderland Stamp Set. Such a Wow creation!!. Sooo beautiful.